Are All Of The Plastic Binding Combs Round Or Are There Some Oval Shapes? Did you know that the diameter shape of most plastic binding combs is round or circular, however there are some larger sizes that are oval shaped? Every couple of months we get the question asking if the larger sizes come in the round configuration. For stability and ease of opening when laid flat, the binding combs that measure 1-1/4″ up to 2″ in diameter are oval shaped. 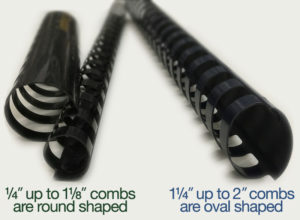 Comb diameters of 1/4″ up to 1-1/8″ are created in the round format. The oval shape allows larger booklets with many pages to have ample clearance when turning through the sheets so that the facing edges/corners inside the combs will not scrape together, get caught on each other or bend. Additionally, the oval diameters feature locking tabs at both ends of the comb for added stability. Without those locking tabs, it’s possible that the combined weight of the sheets could force the comb teeth open and un-threading of your pages. In a related post we answered a question about the security offered by these locking tabs: Do The Locking Tabs On ‘Sure-Lox’ Plastic Binding Combs Offer Any Security? Do you have any questions regarding plastic comb or any other booklet binding methods? Please ask away in the comments below or feel free to reach out to us. Do The Locking Tabs On ‘Sure-Lox’ Plastic Binding Combs Offer Any Security? 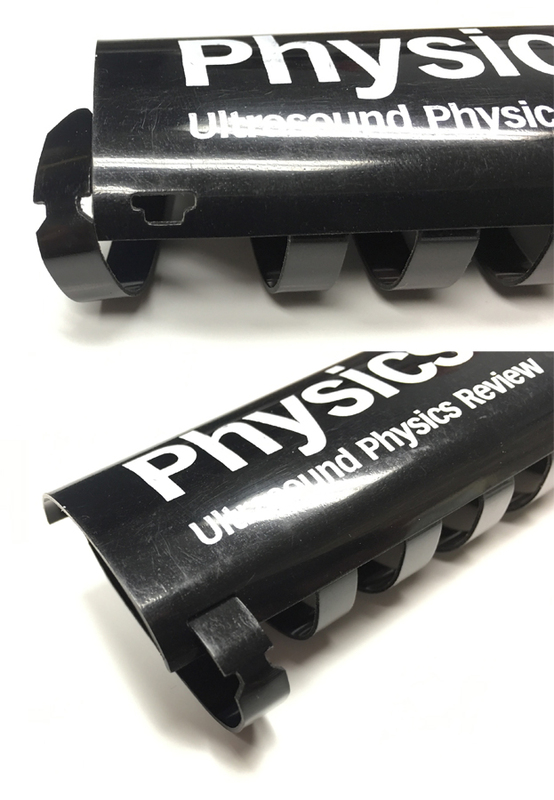 We heard from a customer a few days ago asking if the locking tabs on our plastic binding combs offered any security to prevent someone from opening the binding and removing or inserting pages. Well, those locking tabs really do not provide any security as they can be opened very easily. Their primary function is to create some stability for the larger diameter combs. Without the locks, the binding comb teeth could flex and slide out the open ends of the binding element. They just serve as a way to keep the outer teeth in place. The locking tabs are found on combs with diameters from 1-1/4 up to 2 inches. Do you have any questions on secure document binding? Ask away in the comments below. 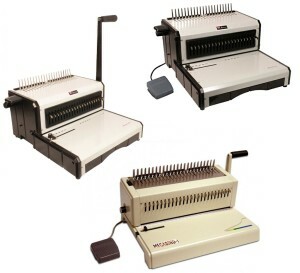 We’re proud to announce the newest additions to our lineup of plastic comb binding equipment. Three new machines by Akiles have helped to fill some gaps in the lower to md price ranges of this product offering, from light to medium duty. Manual, 12″ wide, open-ended punch with disengageable die pins, adjustable side stop & margin depth settings – built in comb spreader opens combs up to 2″ – punch capacity: 25 sheets. An electric version of the Alphabind manual model with a 12″ wide punch throat with disengageable die pins, adjustable side stop & margin depth settings – built in comb spreader opens combs up to 2″ – punch capacity: 25 sheets. What features do you look for when considering a punch? We’d love to hear your thoughts in the comments below. Perhaps you’ve been there – you have the task of punching & binding a large run of booklets. Maybe it’s stacks and stacks of pages, mountains of thousands of sheets that you need to punch with a manual punching machine. Then there’s the vinyl covers or clear covers needed for each booklet and on most punches, you can only effectively punch 1 or 2 of these covers at a time as opposed to the 12-20 inside sheets. While this may seem like an enormously large job to tackle, for one binding method, there is some relief for your handle-pulling arm. Pre-punched covers can save significant time (and fatigue) for the bindery operator in your reprographics department. 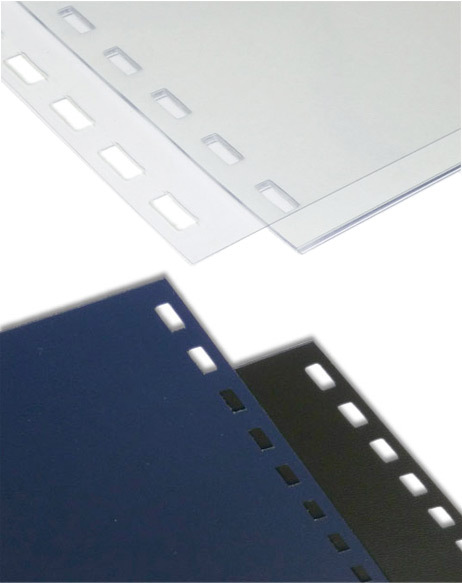 If you are using plastic combs to bind your booklets (GBC binding), you can get pre-punched covers that will reduce your time to complete the binding job. This familiar punch pattern is available on composition vinyl covers and on clear, glossy covers – already punched for you. Imagine not having to punch your booklet pages at all – sound impossible? Well you can also get pre-punched paper in a variety of punch patterns to print your pages on your copier or printer. These patterns include 3-hole (for 3-ring binders), the 19-hole GBC comb binding pattern and the 11-hole pattern for Velo/Ultrabind/thermal binding. A common question that we get is, “Why do you not offer covers or paper pre-punched for coil binding?” There are so many variables that come into play with coil binding such as hole size and hole spacing can vary widely among machines from different manufacturers. However, if you can provide a sample of your coil-punched pattern, we may be able to get a custom punched run quoted for you if you need a sizable amount of covers. What are some of the tips that you have for reducing your time spent punching or binding books? Please share in the comments below. Imprint Copy/Artwork – this is the trickiest part of these imprinting jobs. Straight text or type is a no-brainer – easy peasy, lemon squeezie. However, if you want a logo or any image other than letters, we need to evaluate it to make sure it can imprint well. Solid colored images work well, but photos or any images with gradient tones will have some issues printing well. Just send the logo in an email and we can quickly let you know if it will work. Ink Color: most imprint jobs are created using a single ink color. Black, white, silver and gold are standard colors. Any other colors can be custom mixed for an additional charge. More than one color can be imprinted, however the imprinting process used for these does not allow for exact registration and the colors must not come close to touching. Comb Color – you can choose from Black; White; Blue; Red; Navy; Clear; Hunter Green; Maroon; & Light Gray – Matte Black is also available in limited sizes. 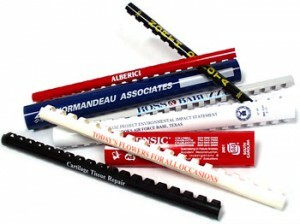 See plastic comb choices by clicking here. Comb Diameter(s) – just let us know which size(s) you need. Ordering multiple sizes is perfectly fine. Keep in mind that the smaller the diameter, the less area there is to imprint your information. If you’re not sure which size will hold your documents, look at our Capacity Charts for maximum number of sheets/thickness. Comb Length – most standard combs for binding along an 11 inch edge have 19 rings (teeth) and measure 10.75 inches long. If you are binding on the shorter 8.5 inch side of a letter size document, then your combs would have 15 rings at 8.25 inches. Quantities – the minimum order for a custom imprinted coil run is 1000 total pieces. The good news is that you can split up sizes to total that number: 700 ½” combs and 300 1″ combs will meet the minimum order quantity. So if you have ever thought of putting you logo or business name on the side of a plastic comb – just let us know what you envision and we’ll try to make it happen for you.